Before claiming any tasks, you must create a profile in the contest. 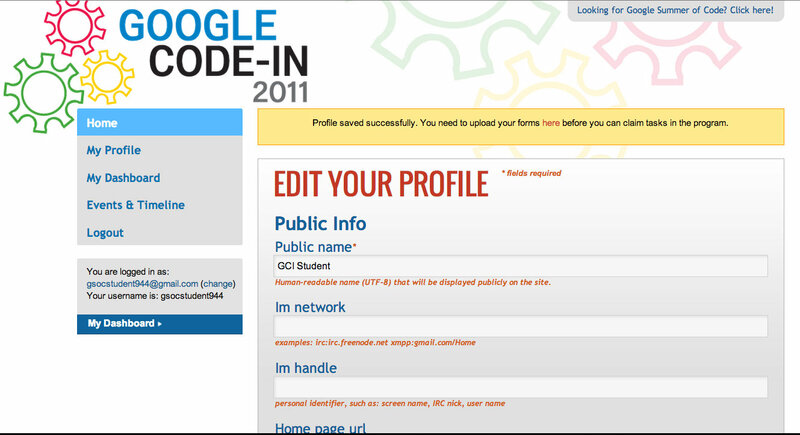 To participate in Google Code-in you will need to create a profile in Melange. Please remember that you need to have a Google account in order to register and create a profile with the contest. If you don't have a Google account, you will need to sign up for one at accounts.google.com/signup. Once you have a Google account, the first step to creating a profile is to press the Login button on the left hand navigation bar. You can also press the Register As Student button on the homepage. You will then be taken to an age verification page to make sure you are an age that qualifies to participate in the contest (13-17 years old). Fill in your birthday in the format Year-Month-Day. Press Submit when you are done. Once you have successfully entered your age you will be asked to login to your Google account. Once you have logged in to your Google account you will be brought to the Register As A Student page. You will need to fill in your name, email address, home address, and other optional information. You can also fill in your shipping address (if different from your home address) for any items that may be mailed to you after the contest concludes. Make sure that your Public name is professional and consistent with the name or handle you may already be using online. For example, if your name is Jane Chow you might choose "jchow" or "skierj" as your Public name. We recommend not using your real full name "Jane Chow" for your Public name. Please do not choose a Public name that is potentially offensive, such as "jacktheripper". 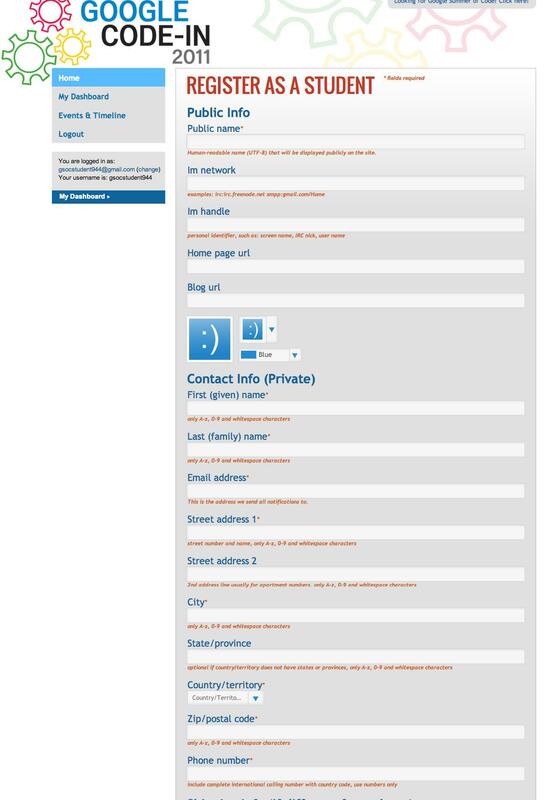 For "Email address", please enter an email address to be used by Organization Administrators or Mentors to communicate with you via comments and to make you aware of changes in status to your tasks. It is strongly advised that your Google account email address but it is not required. 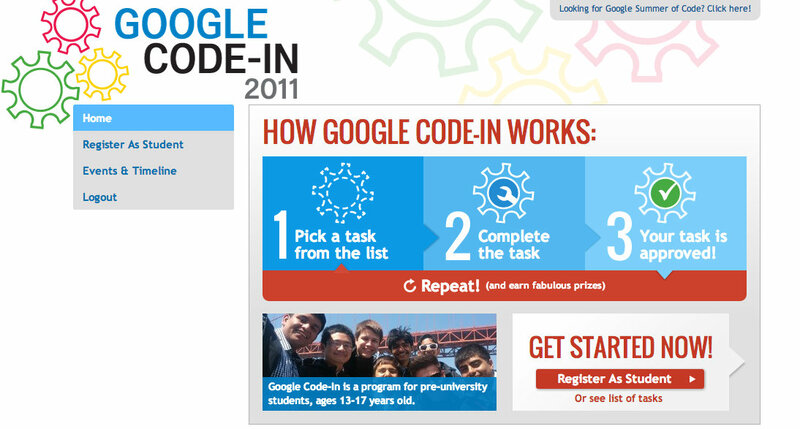 This email will be used as the primary mode of contact by Google throughout the contest, e.g. the email address which we will use to notify you of incorrect forms or any issues with the shipping address for your prizes. For IM handle, Home page url and Blog page url, please note that these are not required text fields. Leave the fields blank if you do not use IM, blogs, etc. or you prefer not to share that information. You'll need to press Submit at the bottom of the page. If you do not fill out a required field or put invalid data in the form, fields with errors will be highlighted in red. If you have successfully completed your profile, you'll see a yellow box at the top of your profile that reads "Profile saved successfully. You need to upload your forms here before you can claim any tasks in the program." Press the link for here on the page to be taken to the "Student form upload" page. When you first visit the "Student form upload" page you will have green Attach a file buttons to upload each form. Press the Attach a file button when you are ready to upload each form. When your form is uploading you will get an orange progress bar. Upload the second form using the same process. Once you have uploaded both forms you can go and claim your first task. A Contest Administrator will Review your forms within 5 days. Your forms will remain in the "To be verified" state until the Contest Administrator has marked them as "verified". Please note that you may be contacted in this time to re-upload your forms or make changes. You can re-upload your forms using the Re-upload button next to the appropriate form. When the Contest Administrator has Verified your forms, the orange "Verified" button will be displayed on your Dashboard. Congratulations! Once your forms are submitted you can start to claim and work on tasks. You will see a "Get Started Now!" section on the homepage when you can start to claim tasks. Click on Search for tasks to search for tasks that can be claimed. You can see the full list of tasks on the Tasks page. 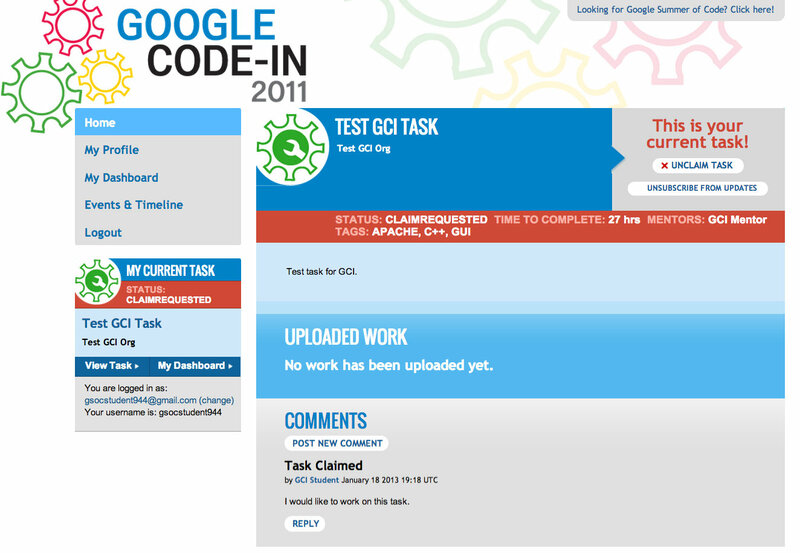 You can click on a task in the list to be taken to that task's page with more description about the task. You can click on Claim this task! to request to claim the task. Please note that your request must be approved by the Mentor or Organization Administrator for the organization before the task is yours. The page will refresh and the task view will change. Because you can only work on one task at a time, even when you have requested to claim a task but the request has not yet been approved this task will be listed as your current task. The Mentor for this task will be notified of your request to claim the task. You can comment on the task if you would like to give the Mentor more information, but you must wait until the Mentor or Organization Administrator has approved your claim before you can start to work on it. Once the request has been approved the task view will change again. 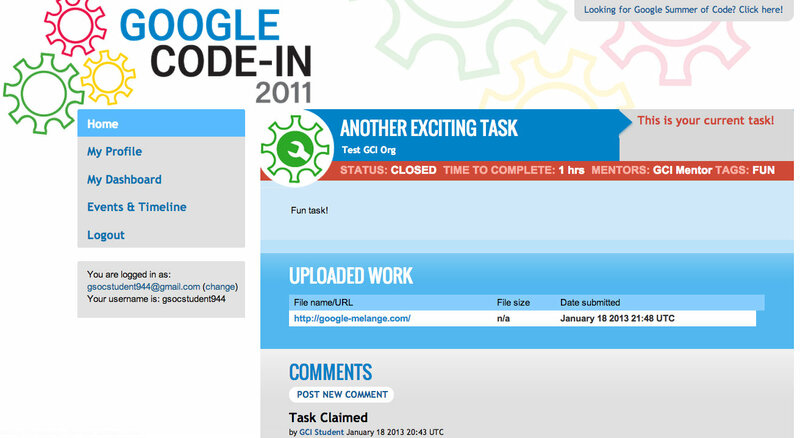 You will see that Melange puts automatic comments on the task when the status of the task changes. You will now have the option to upload work in the form of a URL or a file upload. 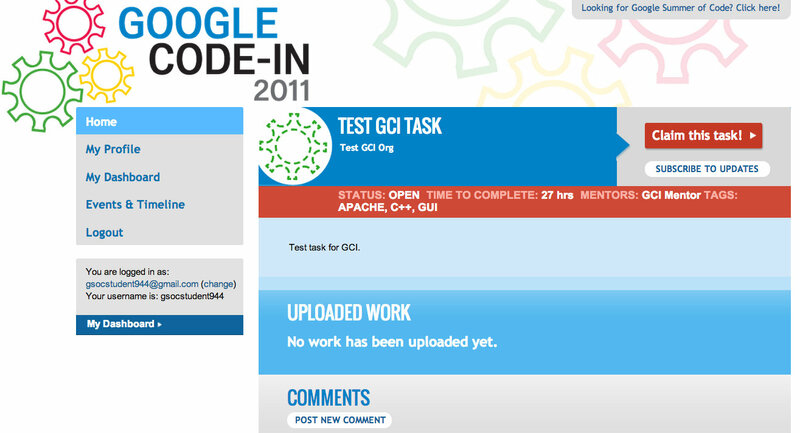 Upload your work when you are ready to do so. 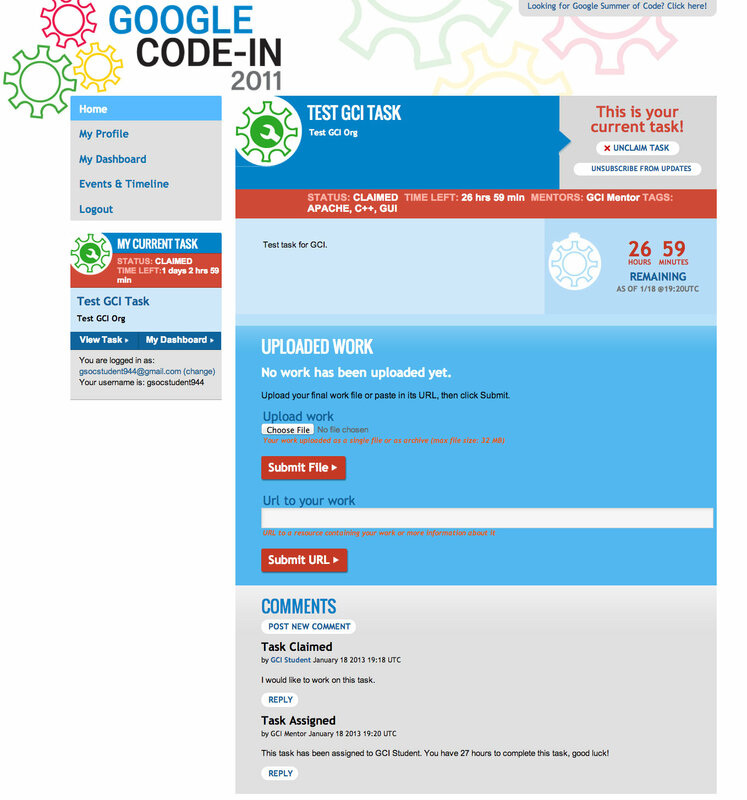 Click the Mark task as complete button to send a notification to your Mentor that the work is uploaded and ready for review. Unclaim task: If you have decided that the task is too difficult or you do not want to work on it any longer you can press the Unclaim task button. The page will automatically refresh and the task will no longer be yours and you can go claim another task. Unsubscribe from updates: If you do not want to receive email notifications about comments or status changes to this task you can press Unsubscribe from updates. Comment: You can make a public comment on any task if you would like to get more information from the Mentor about it. 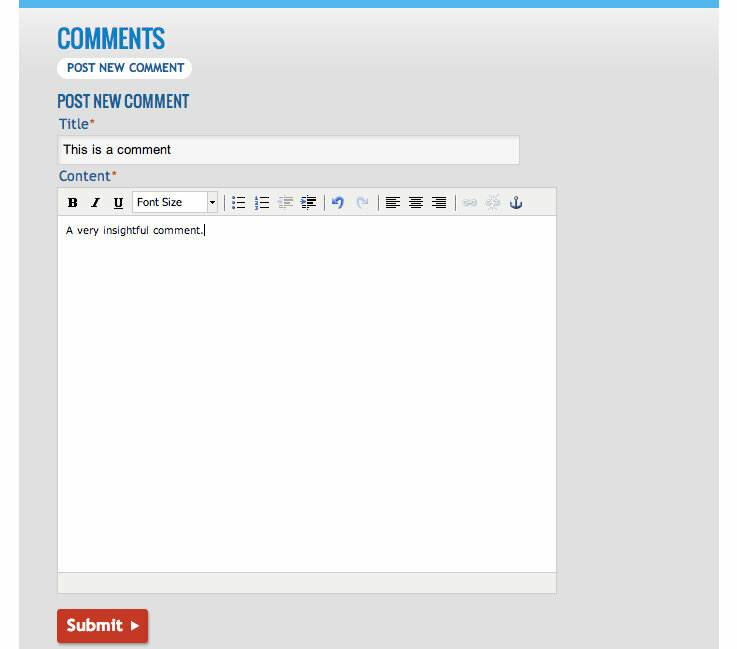 Note: you will need to give the comment a "Title" and enter your comment text into the Content field before hitting the Submit button. If the amount of time allotted to the task runs out before you can upload work and/or have the task marked as complete, you will see the task change to "ActionNeeded" status. You will need to speak to your Mentor about extending the deadline for the task in order to give you more time to complete it. You can also unclaim the task if you aren't going to be able to finish it. Once you have uploaded your work, marked it as complete, and your Mentor marked the task as closed, you are done with your task! You can now claim a new task to work on from the open tasks. What is a Contest Administrator?